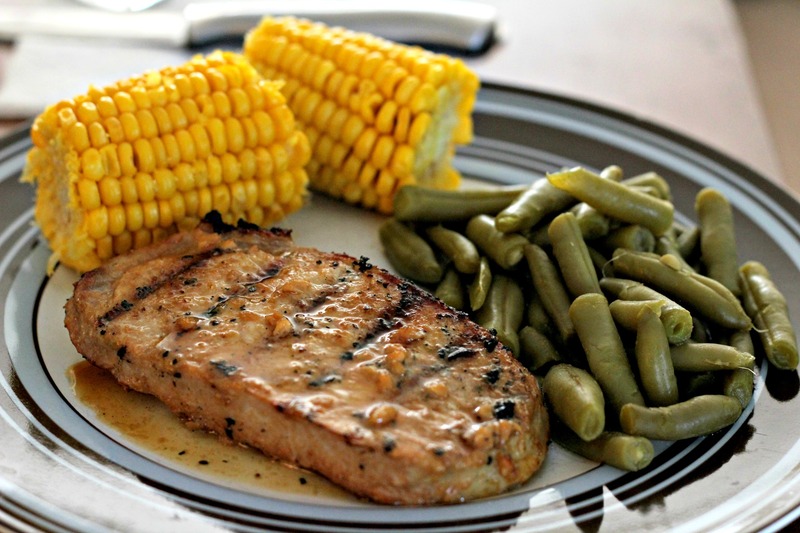 Grilled pork chops happen to be my one of my favorite summertime dishes. We typically marinate them in some plain ol’ Dale’s sauce. It’s nothing fancy, but dang it’s good! Plus there’s no fuss to just sticking some chops in a marinade and then pulling them out a few hours later to grill. Well today’s recipe is for a delicious pork marinade that’s also really easy to throw together. I’ll always be a fan of Dale’s Sauce, but this is a nice change of pace! This marinade has a savory flavor that seeps into the meat really nicely. I’m not a huge fan of soy sauce, so I was a little nervous to see that soy sauce is a primary ingredient. I was afraid it would come out tasting like an Asian sauce and not that American backyard grilled flavor. Well, no worries, folks. It didn’t taste too Asian at all, and it was so delicious! I even wanted to lick the leftover juice off my plate when I was done….I didn’t though…and I kinda regret it. In deep bowl or ziploc bag, mix all marinade ingredients. Marinate at least 2 hours (Mine marinated for about 5 hours). Remove from marinade and cook over medium-high heat on greased grill for no more than 15 minutes or until done, turning halfway through.